…or a clean slate chalkboard in this case! For YEARS, I “collected” Noah’s Ark. Anyone who likes something can attest, you get a few things and then all of a sudden your entire house can be made of it. Oh, you like Noah’s Ark, here I found Noah’s Ark toilet paper..hahahaha. Seriously, I did appreciate the gifts, but it can take over at times. 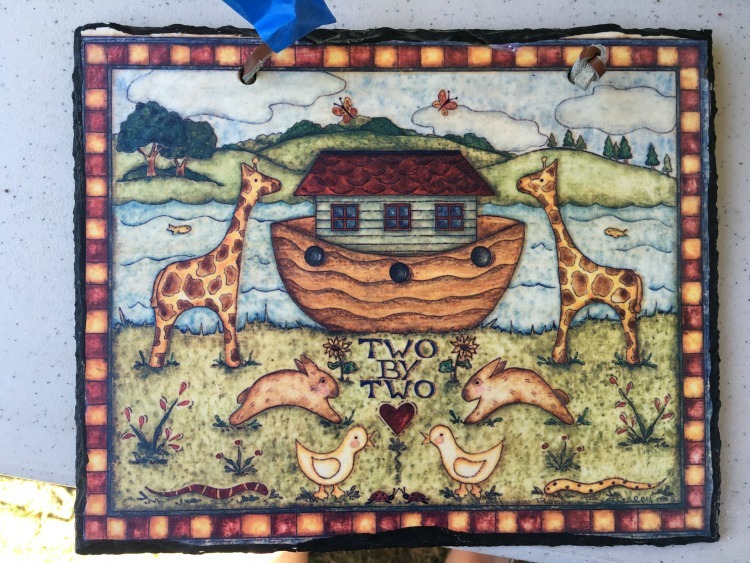 Anyways, I had this cute sign but just decided on a couple of Noah’s Ark pieces and that was that. I couldn’t bring myself to letting this one go, so it stayed in my “do something with” closet. We use affiliate links, at no additional cost to you. This will assist you in finding the same, or similar items used, while we may get a few cents to keep the content free. You can read our full disclosure policy here. These signs are actually really common, at the thrift stores I frequent, and this project couldn’t be simpler. Take some painters tape and wrap it around the hanging cord (as you can see in the above pic). Place sign in a well ventilated area, on a piece of cardboard, so you can spray paint it. TIP– If you are new to spray painting, the best technique requires a little patience. One smooth light coat, let dry, and repeat until well coated. You won’t get it done in one shot, usually. How to get a smooth first coat? Start spraying before your project and move your arm in one motion over the project. Don’t stop spraying until you are off the item. After the chalkboard was painted, a stencil was used. If you want the stencil permanent, you can paint on your stencil. If you don’t want it permanent, first you must condition the chalkboard by rubbing chalk all over it and then wiping off with a paper towel. This will leave some chalk on there so when you erase your saying, it won’t leave a shadow. You can either use this or this (with a pencil sharpener to make a tip), to write with. That was it. 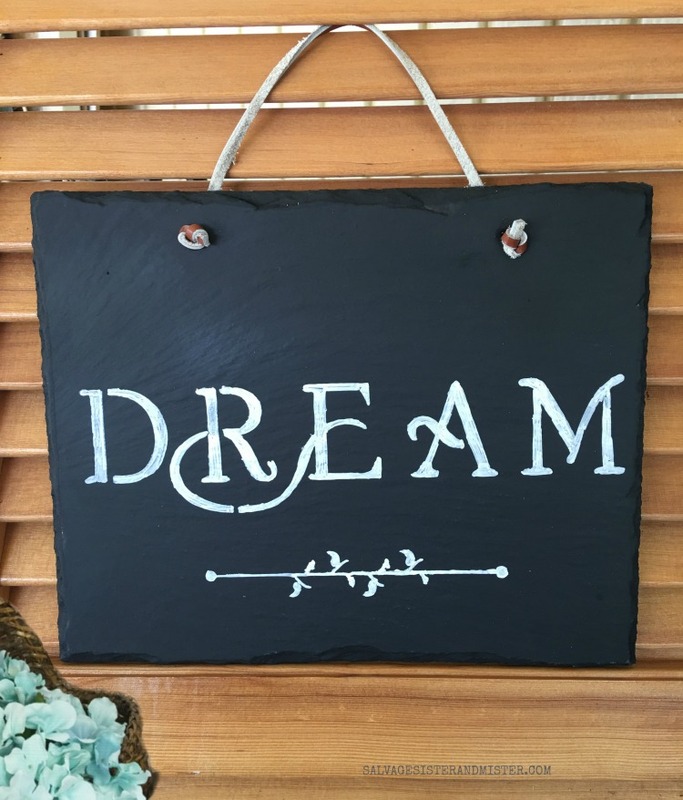 Super simple and updates this little sign to something a little more current – Can’t go wrong with chalkboards, right? 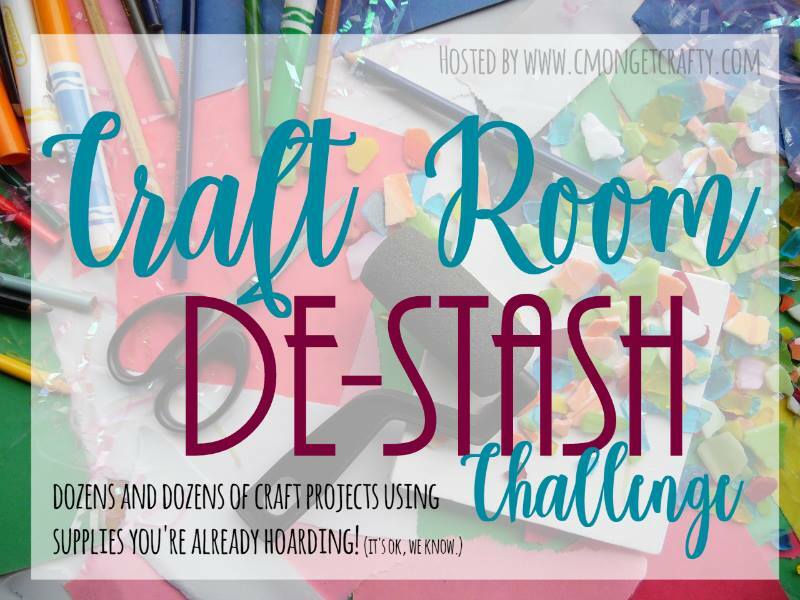 Don’t forget to check out the other craft de-stash participants below and…. Love the sign but I seriously needed those spray painting tips. I tend to be so heavy handed and want to do everything in one spray and it always ends up looking like uhgness. Most of the time I have to get the hubby to for for me. He has that slow, easy arm movement down to a T.
The Mister has to train me on these ways cause I am a just get it done person (impatient) and he takes his time and it is so much better. Thank you Kimberly! I love how it turned out! 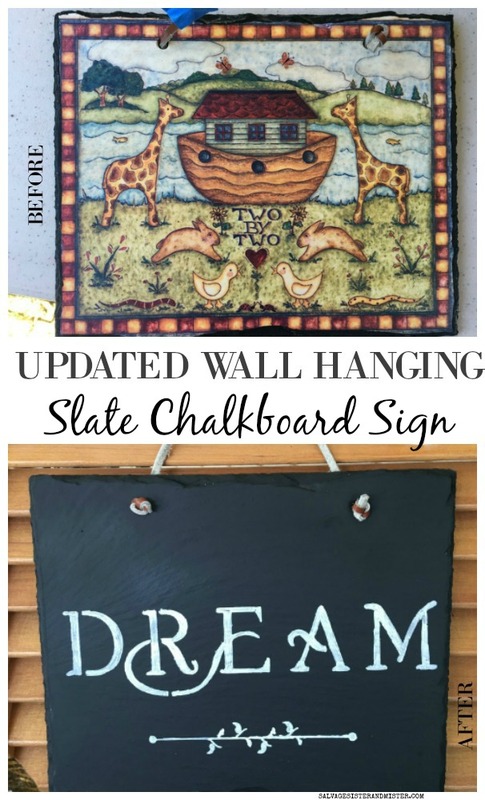 I’ve never used chalkboard paint – I had no idea that you had to condition it to make it reusable! RosEnn, Whenever you use any new chalkboard is is suppose to be rubbed over with chalk first otherwise the first time you erase you will see the letters. You just rub chalk all over it and gently wipe off with a dry paper towel which will still leave behind a thin layer of chalk. This is so sweet. I really like chalkboards and this now looks like a piece of slate. Very nice idea. What a great upcycle! Thanks for the tip about conditioning the chalk paint before writing on it. I had no idea. Oh yes, conditioning a new chalkboard is so important to making sure your letters will erase. Thanks Christina. Hard to go wrong with chalkboards! I didn’t know you have to condition the chalk paint before using a stencil to make it non-permanent. Thank you for sharing this, as I am about to make a chalkboard sign myself (hopefully) pretty soon. There are just soooooo many projects waiting in line, lol…. Habiba, Just a little rubbing of the chalk all over the board, first, will get your board in tip top shape.